Life of Meg: The PERFECT Gift + New Sponsor! Boy oh boy, have I got a fabulous treat for you! Well as most of you know, Christmas is right around the bend, and it's time to start thinking about your gift list! Well, don't you worry your pretty little heads... I've got you covered! Well, it's more like Scentsy Wickless Candles has you covered! Talk about THE perfect Christmas gift for anyone and everyone! Scentsy Warmers use a low-watt bulb to melt specially formulated scented wax slowly, maximizing the fragrance time of the Scentsy Bar or Scentsy Brick. 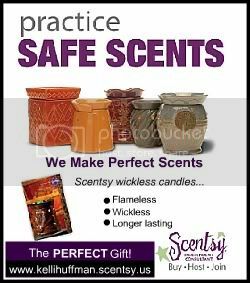 With no flame, soot, smoke or lead to worry about, the Scentsy system is a safe way to enjoy more than 80 delightful Scentsy fragrances. For the past year and a half, I have not been able to get enough of Scentsy Wickless Candles! I have the adorable Merino warmer in my office, the cute Green Weave plug-in warmer in my bathroom, and an ever-changing warmer in my living room! I'm obsessed! I have given almost everyone I know a Scentsy warmer and scent bars - total crowd pleaser! I'm talking everyone... perfect for BF, mom, sister, dad, cousins, friends, etc. With such an amazing collection of warmers, you can find anything from sports to military to pretty/girly! I absolutely love the way Scentsy makes my whole house smell amazing! It's safe enough to leave on all day while I'm at work or turn on right before company comes. The best part? All you have to do is break off a piece of the Scentsy bar, put it in your warmer, switch on the lightbulb and wait for the wax to melt. Voila! Your home will soon be filled with an amazing Scentsy aroma. Plus, one scent bar lasts FOREVER! Goodbye wicked candles... I'm sold. With more than 80 scents, I promise their is a perfect scent for everyone! Check out all of the amazing Scentsy scents HERE! Well lucky for us, [Life of Meg] has a brand new sponsor! It's my pleasure to introduce Kelli Huffman of Scentsy Wickless Candles to you. Kelli has been with Scentsy since 2008 and I've enjoyed all of the products she has helped me find through her Scentsy business! Not to mention she's a total sweetheart! Kelli loves helping her clients find the perfect gifts for birthdays, Christmas, teachers appreciation gifts, weddings or simply just because! Visit Kelli at Scentsy today to make sure you've covered everyone on your Christmas list! With amazingly affordable products, Scentsy is a must! Kelli, thank you so much for sponsoring [Life of Meg]! So very happy to have you here and to be able to share all of these amazing Scentsy products that I love with all my sweet blog friends! Scentsy is awesome! I love them! I'm going to a Scentsy party this weekend and am totally buying the green weave plug-in for my bathroom too! Great minds think alike! :) I totally need to smell the 'Lucky in Love' scent - That would be too perfect!